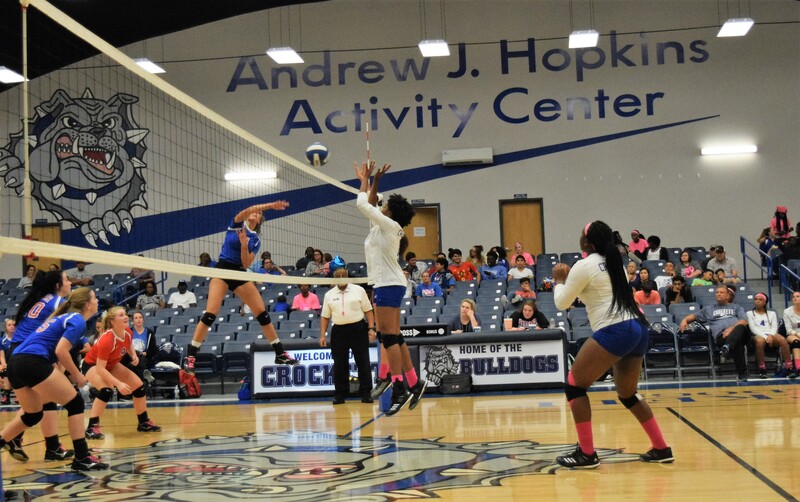 CROCKETT – The Crockett Lady Bulldogs welcomed the Lady Elks of Elkhart to the Andrew J. Hopkins Activity Center for a District 20-3A volleyball match on Tuesday, Oct. 9 with postseason implications on the line. The Lady Elks are in a fight for the fourth and final playoff spot and while the Lady Bulldogs still have an outside chance, but they’re going to need some help. That help didn’t appear on Tuesday as the Lady Elks swept the Lady Bulldogs by a final score of 25-18, 25-12 and 25-22. As the match got underway, the Lady Bulldogs took the early lead by a score of 6-3. The Lady Elks tied the score at nine apiece and then seized a lead they would not relinquish. Crockett managed to whittle the lead down to 13-15, but then Elkhart rattled off five straight points to take a commanding 20-13 lead as they held on to win Game One by a final of 25-18. In Game Two of the match, Elkhart jumped out to an early 6-0 advantage and kept Crockett from getting any closer than five points as the Lady Elks won Game Two of the contest by a score of 25-12. Game Three was close throughout. The Lady Elks took a sight one point lead early on only to see the Lady Bulldogs fight back to take the lead at 7-6. Crockett pushed the lead to four at 14-10, before the Elks fought back to tie the score at 15. Elkhart took the lead at 17-16 only to see Crockett rally to take it back at 20-18. It looked as if the Lady Bulldogs might extend the match, but then the Lady Elks went on a 7-2 run to close out the game by a score of 25-22. The win gave Elkhart the series by a final score of 3-0 (25-18, 25-12 and 25-22). 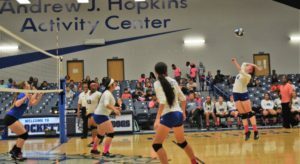 Next up for Elkhart is a road match against the Buffalo Lady Bison on Friday at 4:30 p.m. while the Lady Bulldogs stay at home to face the Frankston Maidens. As of press time, both scores were unavailable.